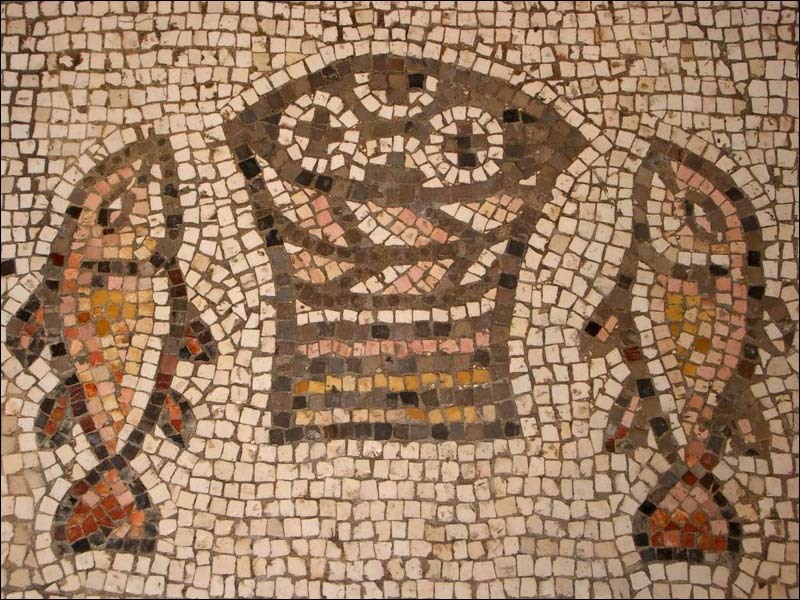 Fifth century mosaic of "Loaves and Fishes" from the floor of an ancient church and monestary at Tabgha, on the north shore of the Sea of Galilee, near where Jesus is said to have fed the 5,000, thus initiating his Bread of Life discourse. Larger image. 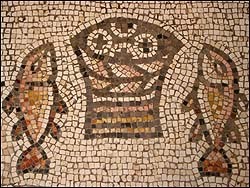 One way to enrich your experience of the Lord's Supper is to sing songs designed for communion. Many songs about the cross, Christ's sacrifice for sins, and communing with Jesus are appropriate. But here are specific communion songs, arbitrarily divided into newer and older songs. Many of these, especially the older ones, have the lyrics available online. As you meditate, read out loud some of these wonderful poems of Eucharistic worship. Most of the words and tunes can be found in the Song Select feature of Christian Copyright Licensing International (CCLI, www.ccli.com). Blest/Sweet Feast of Love Divine, words by Edward Denny (1839), music by George F. Handel, or by Hans G. Nägeli (1773-1836). Zion, Praise Thy Savior, Singing, words by St. Thomas Aquinas (1263), translated in The Hymnal 1940. A rich collection of communion hymns is the Chalice Hymnal (St. Louis: Chalice Press, 1995), which serves the Disciples of Christ, who partake of the Lord's Supper each week. The hymnal contains 50 such hymns. For older communion hymns, a rich resource is Christian Worship: A Hymnal (Christian Board of Publication; St. Louis: The Bethany Press, 1941). The Hymnal 1982 (The Episcopal Church; Church Hymnal Corporation, 1985) is also a rich collection of mainly older songs, some translated from ancient hymns.